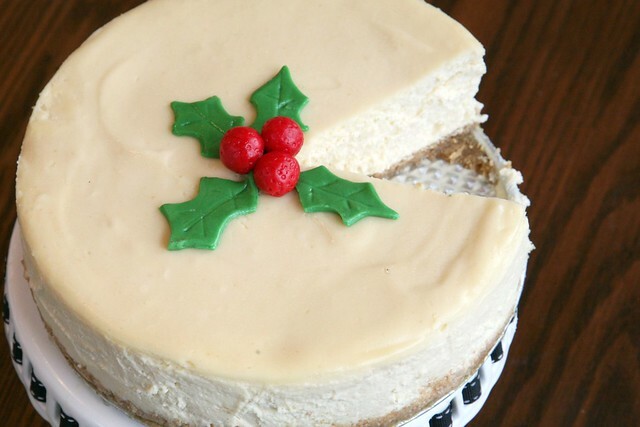 And to really make a statement that this cheesecake ain't for any old time of the year, I marked it with a universal sign for the Holidays: Holly. Fondant Holly. I know what your thinking, you. I could SELL these. You want one? Email me at iheartbaileys@sweetkiera.com. Unfortunately, in this particular cheesecake, the crust came out slightly damaged because my aluminum foil boat in the hot water bath had a small leak which allowed a touch of liquid to sneak into the spring form pan. I didn't hear any complaints, though. For the graham cracker crust, I used a recipe from Annie's Eats post on New York Cheesecake (who adapted it slightly from Baking Illustrated). 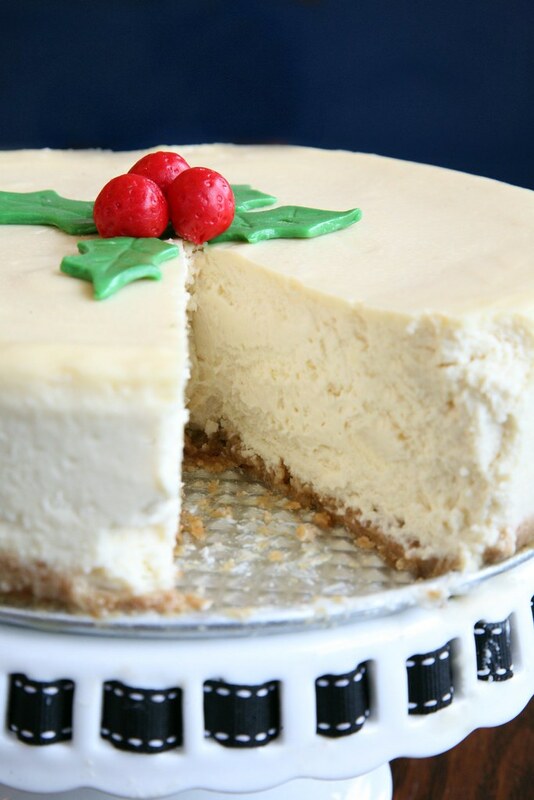 For the cheesecake itself, I adapted the ("Creamiest Amareto Cheesecake" recipe from BakeWise, which includes both sour cream and whipped heavy cream for, you guessed it, the creamiest cheesecake. I replaced the Amareto in the recipe with 1/4 cup of Baileys. BTW, I promise that cookbook is one of the best purchases I have ever made. Actually, my mom bought it for me. :) One of the best purchase MY MOM ever made! ...For me. Preheat the oven to 325 degrees F. Brush the bottom and sides of a 9-inch springform pan with the 1/2 Tbsp of melted butter. In a medium bowl, combine the graham cracker crumbs, the remaining 5 Tbsp. melted butter, and sugar. Toss with a fork until the crumbs are evenly coated. Transfer the crumbs to the springform pan and use the bottom of a ramekin to firmly press the crumbs evenly into the pan bottom. Bake for 12 to 15 minutes, or until lightly browned around edges. Let cool on a wire rack. Arrange shelf on lower third of the oven with a baking stone. In a stand mixer with the whisk attachment, whip heavy cream until soft peaks form. Then whip about 30 more seconds. Cover and refrigerate until needed. In a stand mixer with the paddle attachment on medium speed, blend cream cheese and sugar until smooth. Add eggs, one at a time, and beat on low after each addition until combined. Add in baileys, vanilla, salt and beat until combined. Using a spatula, stir in the sour cream. Then gently fold in the whipped cream. Pour into the crust. To prepare a water bath, fold a terrycloth towel and place it in the bottom of a large roasting pan or baking dish, at least 10 in wide. Place the aluminum-wrapped springform pan on top of the towel. Pulling the lower oven shelf out slightly and place roasting pan on top of baking stone. Pour boiling water into baking dish until it comes up to about about 1 inch on side of springform pan. Gently easy shelf back into oven and close door. Bake for 45 minutes (without opening oven door). Turn oven off, let stay in oven for another 1 hour. (About 3 inches of the center will still wiggle a little - that’s ok.) Remove from oven and refrigerate overnight. 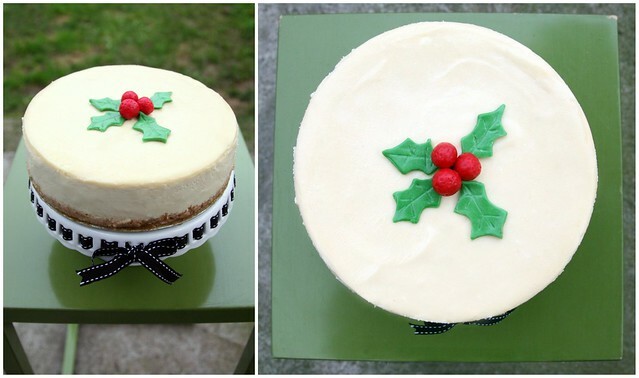 Optional finishing touch: Decorate with holly leaves and berries made out of fondant. See tutorial on Wilton here.